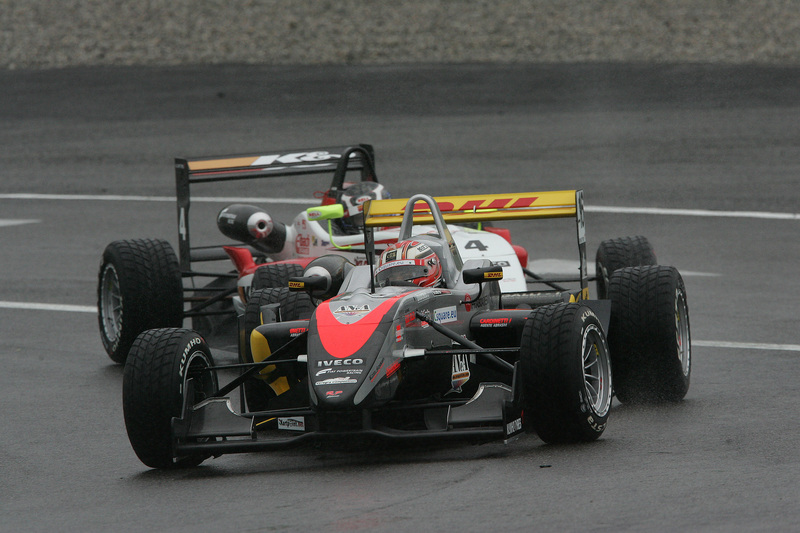 15/05/2011 - Daniel Mancinelli won the first race of the opening weekend of the Formula 3 Italian 2011 Championship at the end of a recover from eleventh up to the top step of the podium. The Italian driver for RP Motorsport is the first winner in the 46th edition of the tricolored series with a solid race run at Franciacorta’s circuit, wet by rainfalls. Mancinelli, sixth in the heat of lap one, first of all overtook Michael Lewis (Prema Powerteam) with who he started a duel in the first laps and then started a great recover that in the second part of the race took him to move in first thanks also to a spin by Raffaele Marciello at lap 16 of the 22 laps. The 16 years old Swiss driving for Prema Powerteam, pupil of the Ferrari Driver Academy, produced an exalting first half of the race with an overtaking for the first position during lap 3 on the poleman Edoardo Liberati (Team Ghinzani) followed by a solid advantage from the rivals. The Safety Car deployment due to a car stalled in trajectory voided all the gaps while a spin in the last corner during lap 16 forced him to slip down in third under pressure by Mancinelli, author of a series of fastest laps. Maxime Jousse (BVM-Target) negated Marciello the victory in the rookies classification with the French driver recovering from the ninth position of the grid and was particularly at ease in the wet and set the fastest lap. Behind Liberati, author of a defensive race due to a sub-optimal setup, the Milanese Kevin Giovesi (Lucidi Motors) and had to contempt himself with the fifth place ahead of his team mate Eddie Cheever. Jesse Krohn (RP Motorsport) has been author of an attack race and managed to secure the seventh position after a furious recover starting from the 13th place of the grid. The Argentine Facu Regalia (Team Ghinzani) was victim of the grit of the Finnish driver and after a contact during an overtaking manoeuvre ended up with a broken suspension causing his retirement. The last overtaking by Krohn was on Simone Iaquinta (DownForce Competitio), with the latter finishing eighth after a thrilling duel with the Californian Lewis, seventh before tenth behind Victor Guerin (Lucidi Motors). The French Brandon Maisano (BVM-Target) ended eleventh ahead of Andrea Roda (Prema Powerteam) and Federico Vecchi (LineRace-CO2), respectively author of the sixth and eighth fastest lap of the race. Only 14th was Sergio Campana (BVM-Target), author of the third best lap but forced to a race in the back due to a spin relegating him to the back of the group during lap one. The appointment is now for 17.00 (GMT+2) with race two starting with the grid delineated by the qualifying’s top eighth inversion and the other positions as in race 2. The first row will be occupied by Guerin and Maisano followed by Lewis and Cheever.